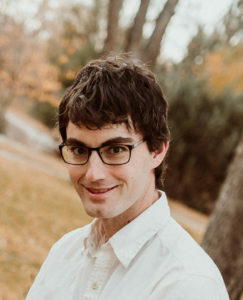 Matt Mason of Omaha will be instated as Nebraska State Poet 2019-2023 at a 10:00 AM ceremony Monday, February 25 in the State Capitol’s Warner Chamber. Governor Pete Ricketts named Mason as State Poet in late January. The public is invited to attend the ceremony. Mason is executive director of the Nebraska Writers Collective and an award-winning poet. He has been actively involved in poetry education and advocacy programs through outreach and long-time community involvement. During his tenure he will be giving public presentations and readings as well as leading workshops and library festivals in communities throughout the state. The Nebraska State Poet selection is the joint effort of the Nebraska Arts Council, Humanities Nebraska and the Nebraska Library Commission in cooperation with the State of Nebraska. To learn more you can visit his website at matt.midverse.com. Nebraska Cultural Endowment wishes to congratulate Matt on this great achievement and thank him for taking on this important role in our State. The Nebraska Cultural Endowment is pleased to announce the election of Dr. Amy Haddad to our Board of Directors. Dr. Amy Haddad is Professor Emerita in the School of Pharmacy and Health Professions at Creighton University. Dr. Haddad served as Director for the Center for Health Policy and Ethics from 2004 to 2018 where during her tenure she led the development of a fully-online graduate program in health care ethics. Amy was selected for the national Carnegie Scholars program in 2001. 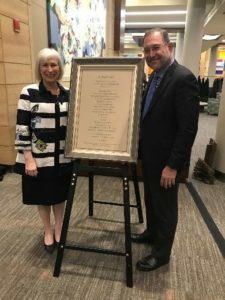 She is currently the Immediate Past-President of the American Society of Bioethics and Humanities, the largest professional association in bioethics and health humanities in the United States. Recently, Dr. Haddad completed her MFA in Creative Writing at Queens University in Charlotte, NC. Amy has a deep passion and love for the arts and humanities. 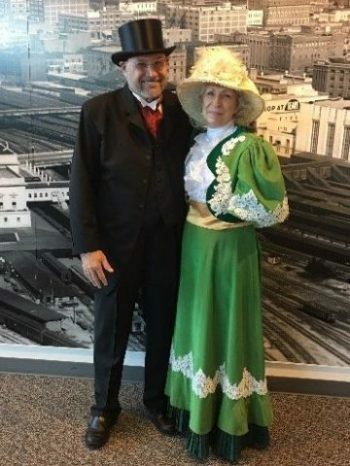 Amy, along with her husband Steve, have been extensively involved in the arts and humanities of Nebraska for many years and see it purely as a labor of love. 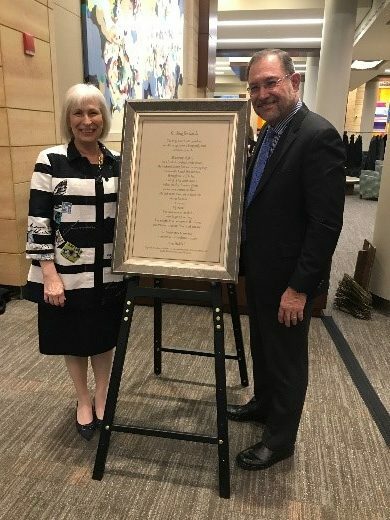 Whether it be presenting a poetry reading at the Buffett Cancer Center in Omaha, serving as honorary chairs of the American Midwest Ballet 2018 Gala or supporting the Blue Barn Theatre 30th Anniversary Gala, among many others, Dr. Haddad is a champion for the arts and humanities in our state. Amy Haddad and husband Steve at Durham Museum event. What are the purposes of the arts and the humanities in society? How do you see the NCE making a real impact for our communities? What roles have the arts and humanities played in your personal growth? Why do you serve as board member of the NCE? What surprises you, or has surprised you, about the arts and humanities in Nebraska? The Nebraska Cultural Endowment is thrilled to welcome Amy to its Board of Directors. Amy brings to the organization a great passion and demonstrated involvement in the arts and humanities. We are grateful for her service to this mission. Jordan Huether didn’t purposefully seek a leadership role in the renovation of his community’s theatre – he just realized he could help, and started helping. Huether “grew up all over the place, but went to high school in Martin, South Dakota” (Huether, Personal Interview), a city of about 1000 people, just 48 minutes northeast of Gordon. In 2010, he graduated from South Dakota State University with a degree in Electronics Engineering, and moved back to Martin to help his father at the newspaper there while he looked for another job. Shortly after, Jordan’s father bought the Sheridan County Journal Star in Gordon, NE, and sent Jordan there to run the paper. Says Huether: “My wife and I fell in love with the community and decided to stay, buying a house in town that summer (2011). We actually purchased the paper from [Huether’s father] January 1 of this year.” (Huether, Jordan; Gordon Theater Blog). Gordon, NE is city of about 1600 people in the panhandle of the state, right at the crossroads of US highway 20 and State Highway 27. It’s had movie theaters since at least the early 1900s, though they’ve burned down several times. In the 1950s, a theatre was built in the place where the Gordon Community Theatre now stands. It burned down in the 60s, and in the late 60s the Gordon Community Development Corporation was formed to build a new one. By 1970 a new theater was built, and changed ownership a number of times, lasting well into the 2000s. In about 2010, however, the theater closed and fell into disrepair. After a few years, the Community Development Corporation regained control of the theatre, and held a public hearing to figure out what to do about it (Brant, Lauren; The Power of Community…). “When I was at college I worked at what was called State Tech, where I helped do all the live sound when bands would come…or when there were presentations…so I was pretty familiar with all of the equipment, with speakers and projectors…so I started looking into it…and I think they were budgeting $100k just for the projector, $200k just for the audio video stuff…I found some different things…cheaper things and better things, and just kind of kept finding more things that I could help them with. They asked me to join the board, and eventually they just asked me to be the president” (Personal Interview). Huether became president of the board in 2015, and drew up a business plan for how they were going to renovate the theatre, and started passing it out. At this point, it was clear that the community wanted the theater to be a non-profit, community-volunteer theater, so they were going to need a lot of contributions from the community, both in money and in man-power. Fortunately, the community stepped up to the challenge. “The Mustangs Committed (a group of kids from the high school) spent a day in the theater grinding off old bolts and sheet rocking the hallway. The Gordon-Rushville boys basketball team came in for a day and painted the interior of the theater and hallways for us. A group of community members came together one Saturday and assembled about 100 seats.” wrote Huether, in an email. “We also had a local gentleman named Fred Russell, who ended up taking a large amount of the construction on himself, doing it all for free. He wouldn’t let us name the theater after him, so we gave him free popcorn for life instead. We also had a local contractor, Jason Harding, move to town and donate a lot of work to help us get open.” (Huether, Jordan; Follow Up Questions). Various community groups helped raise funds for the theater, including a yard sale by the Albany 4-H club, which raised $632, a pancake feed by the Gordon Lions Club, and a meat sale and hamburger feed by Open Range Beef, which raised another $9,400 (Brant, Lauren; Gordon Theater Moves Forward…) (Huether, Jordan; Follow Up Questions). Bob Dehn of Front Range Fire Protection donated a $25,000 sprinkler system, and numerous other volunteers came regularly to help with the manual labor required of the renovation. 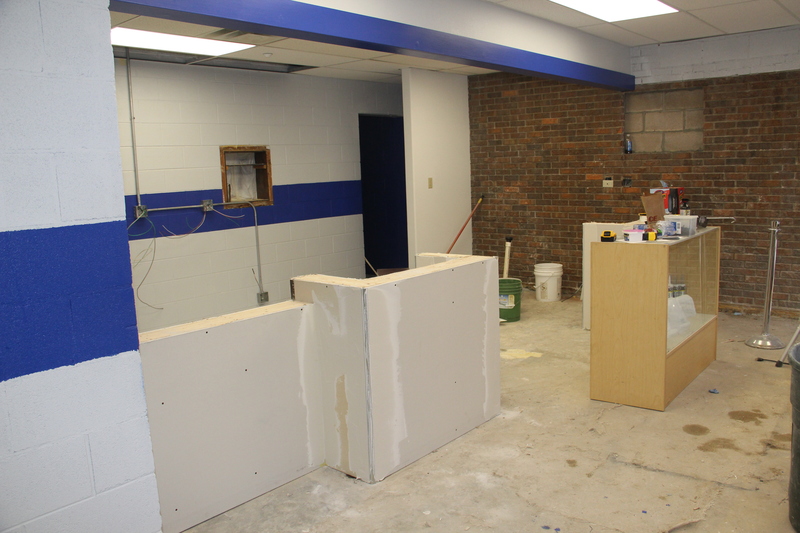 (Huether, Jordan; Progress Continues…). Funds from the Ukena Charitable Trust and the Turner Foundation helped provide a new roof for the theater and a high-definition digital projector (Huether, Jordan; Gordon Theater Gets a New Roof). Then, in spring of 2016, the theater received a $50,000 challenge grant from the Peter Kiewit Foundation, which required the community to raise $58,224 to receive the funds. A daddy-daughter fundraiser dance, a theater seat-sale fundraiser, local donations, some local grants, and a $21,000 panhandle greater good grant helped meet the challenge, pushing the theater past its budgeting goals (Huether, Jordan; Gordon Movie Theater Receives…)( Brant, Lauren; The Power of Community…). 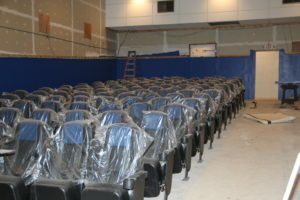 The theater officially opened as of February 16th of this year, and is still going strong. Without a doubt, this theater is a community theater. Not only is it run by the community and serves the community, but it was truly built by the community. Under Huether’s leadership, the community was able to rally together and build the theater that is now a source of entertainment, revenue, and pride. And Jordan, for his efforts and success, is receiving the Emerging Leader Award during the 2018 Governor’s Arts awards. This award is “awarded to an individual artist, arts administrator, patron or volunteer under the age of 35, or someone who has made a significant impact on the arts in Nebraska in a short period of time” (Kennedy, Jared). But it’s clear that what’s most important for Jordan is the impact he’s helped make on his community. 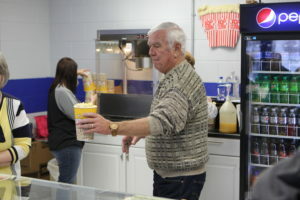 “I’ve got two little kids, and I want them to have something to do here, something to take pride in, here in the community… [I want] the community here to thrive, I feel like [the theater] is definitely going to help bring more commerce to town, more people to town, make people want to live here, give kids something to do” (Personal Interview). Huether, Jordan. Personal Interview. 16 Mar 2018. Brant, Lauren. “The Power of Community Reflected in Gordon Theater.” Sheridan County Journal Star, Sheridan County Journal Star, 28 Feb. 2017, sheridancountyjournalstar.net/news/item/3996-the-power-of-community-reflected-in-gordon-theater. Brant, Lauren. “Gordon Theater Moves Forward with Purchases Following Big Fundraising Weekend.” Sheridan County Journal Star, Sheridan County Journal Star, 8 June 2017, sheridancountyjournalstar.net/news/item/4069-gordon-theater-moves-forward-with-purchases-following-big-fundraising-weekend. Huether, Jordan. “Progress Continues on Gordon Theater as Opening Date Nears.”Sheridan County Journal Star, Sheridan County Journal Star, 19 Oct. 2017, sheridancountyjournalstar.net/news/item/4208-progress-continues-on-gordon-theater-as-opening-date-nears). Huether, Jordan. “Gordon Theater Gets New Roof.” Sheridan County Journal Star, Sheridan County Journal Star, 9 Dec. 2015, sheridancountyjournalstar.net/news/item/3501-gordon-theater-gets-new-roof. Huether, Jordan. “Gordan Movie Theater Receives $50,000 Challenge Grant.” Sheridan County Journal Star, Sheridan County Journal Star, 2 Apr. 2016, sheridancountyjournalstar.net/news/item/3658-gordon-movie-theater-receives-50-000-challenge-grant. Kennedy, Jared. “2018 Governor’s Arts Awards.” Nebraska Arts Council, Nebraska Arts Council, www.artscouncil.nebraska.gov/opportunities/governors-arts-awards/governors-art-awards.html. Huether, Jordan. “Follow Up Questions.” Email. Follow Up Questions, 28 Mar. 2018. Huether, Jordan. “Gordon Theater Blog”. Email. Gordon Theater Blog, 13 Apr. 2018. Since completing my MFA in 2010, I have endeavored to make art the foundation of my livelihood. Though I am a practicing studio artist, I do not rely on the sale of my work for an income. A quick look at my website will demonstrate my lack of broad, commercial appeal… Instead, I derive a livelihood from the knowledge and skills accumulated from the pursuit of making my work. Putting this philosophy to practice, I have taken on several roles; teaching art courses part-time at the university level, working as an on-call museum preparator, serving as an art department shop technician, and currently in a full-time capacity, as the Residency Arts Technician at the Bemis Center for Contemporary Arts. My multifaceted employment history comes in handy at the Bemis, where all staff must wear multiple hats and possess a depth of utility. My primary responsibility is overseeing the Okada Sculpture and Ceramics Facility and providing technical support and process demonstrations to the artists-in- residence, though it’s not uncommon for me to be unclogging a drain, interviewing an intern candidate, or handling artwork for the exhibitions program. For the most part, my position is quite literally a collage of my past occupations, a synthesis of my experience as a teacher, an art handler, a fabricator, a technician, and an artist. That being said, I am still engaged in “the hustle”, as I teach a 3-D foundations course at the University of Nebraska at Omaha in the evening. Having a livelihood with many moving parts has its measure of challenges. Navigating museum practices, researching and maintaining shop equipment, instructing college art students and (now) professional artists in the operation of a multitude of power tools and fabrication techniques, presents an array of (related, but equally involved) subjects vying for my attention. At times, it’s easy for me to lose sight of the big picture, or in other words, undercut the career that prompted my vocational abilities – being an artist, and more specifically, a sculptor. Through a healthy dose of self-reflection, reinforced by natural porosity, my stuttering (yet persistent) studio practice has evolved along side my livelihoods. Completing the circle, my years of exhibition fabrication, tool investigation, and building organizational, shop fixtures have found a ready home in my sculpture. Part bricoleur, part tradesman, I mine my immediate environments for construction materials and found objects to break down and reorganize with my growing aptitude for carpentry – a direct byproduct of my livelihood. and the limited view offered by the mind’s eye. 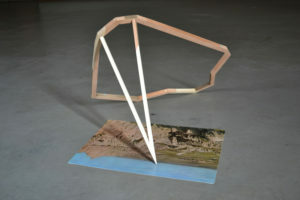 Drawing upon the rock formations of the South Dakota Badlands and their fabricated proxies dotting Lincoln’s Antelope Creek greenway, Johnson carves, constructs, and joins second hand materials into lonely vistas alluding to the slippages associated with memory’s shaky hold on place. Josh Johnson earned a BFA at the University of North Dakota, and an MFA at the University of Nebraska-Lincoln. 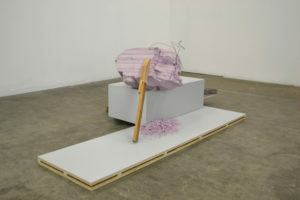 He has exhibited nationally, including shows at the Joslyn Art Museum in Omaha, the Soo Visual Art Center in Minneapolis, Colorado State University, and Manifest Gallery in Cincinnati. 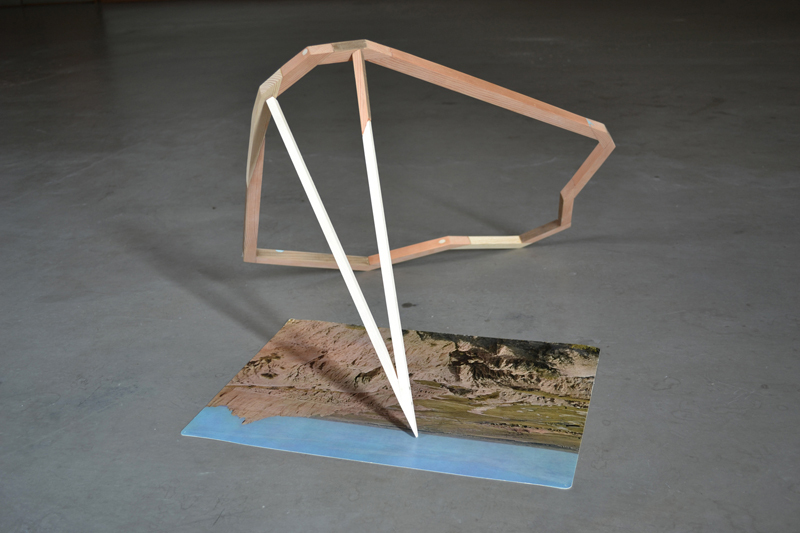 Josh received a 2016 Nebraska Arts Council Individual Artist Fellowship, and was twice selected as a finalist for the William and Dorothy Yeck Young Sculptor’s Competition at Miami University in Oxford, OH. Josh has taught sculpture at Nebraska Wesleyan University, the University of Nebraska-Lincoln, and the College of Visual Arts. He is currently the Residency Arts Technician at the Bemis Center for Contemporary Arts in Omaha, NE and teaches 3-D foundations at the University of Nebraska at Omaha.